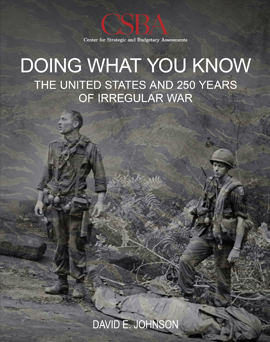 A new study has been released by CSBA, “Doing What You Know: The United States and 250 Years of Irregular War,” which looks at the US’s history in confronting irregular adversaries over the last 250 years, with recommendations for the future. Because COIN is hard and messy, our natural temptation is to pivot away quickly and forget what we have learned; that instinct must be actively resisted. The report concludes that the wars in Iraq and Afghanistan, and ongoing counterterrorism operations across the globe, have untapped lessons about what works and what doesn’t in confronting irregular adversaries and insurgents. This important post-conflict analysis did not happen in the aftermath of the Vietnam War because the country and the U.S. military wanted to move on. But these lessons are increasingly important as the US military and policymakers grapple with how to compete in so-called gray zone conflicts. In the study, author David E. Johnson argues that the United States has been continuously engaged in irregular combat since initiating operations in Afghanistan the aftermath of the September 11, 2001 attacks on the U.S. homeland. Its military forces, particularly the Army, Marine Corps, and Special Operations Forces, have made significant adaptations after the onset of the insurgency in Iraq following the initial success of conventional operations there in 2003. Yet, victory—achieving the desired political objectives—in Iraq and Afghanistan continues to elude the United States more than fifteen years into the Global War on Terrorism despite significant investments in blood and treasure. With this study, CSBA Senior Fellow Dave Johnson endeavors to answer the question: Why is that? The United States has a long history of engaging in irregular wars and countering insurgencies, one that predates its independence. Many of these efforts, as will be recounted, were successful. Others were not. To understand what worked, what did not, and why, this study assesses the measures, both coercive and benign, that the United States has used in a limited number of pivotal cases to determine if U.S. irregular warfare and counterinsurgency (COIN) approaches have changed significantly over the past two centuries. It also makes recommendations for the future.